[dropcap size=big]I[/dropcap]’ll tell you right up front, I’m a big fan of Dan Spurgeon and Drew Blakeman’s Visceral Company. That’s partially because I support “niche theatre”. A theatre that only does Shakespeare? Hot dawg! A company that always incorporates elements of puppetry and dance? Yeah, baby! So a theatre whose mission statement is to bring horror and sci-fi themed plays to the L.A. audiences, well keeno-beano, paddle the fanny and stone the crows, huzzah! In the past the Visceral Company has had great success with their staging of H.P. Lovecraft’s works, and they will be presenting “Zombies From the Beyond – The Musical” as their contribution to the Hollywood Fringe Festival come June. 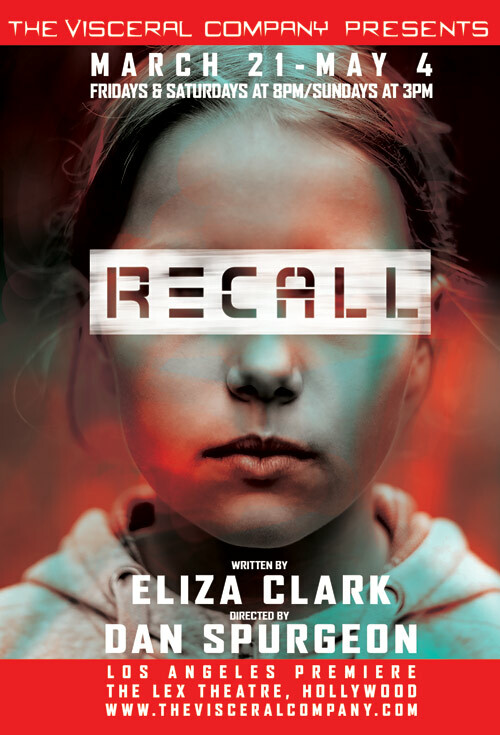 Set in the not too distant future, Eliza Clark’s “Recall” depicts a society which is eating its young for fear of their young eating them. The government now tracks each new born with a special agency. This agency is constantly administering tests and appraising each child’s development, screening them for any hint of sociopathic tendencies. Children found with these traits are “recalled”. Lately I’ve been finding the combination of successful TV writer and critical success in New York as a sure fire indicator of a disappointing evening in the theatre. And while that was not the case in “Recall”, it did come darn close to the edge. “Recall” inhabits a world of cheap motels and soulless clinics, and strikes me as one of those problematic shows which require that a great deal of money be spent to establish the look of a show which hasn’t had a great deal of money spent on it. Creating a bleak, antiseptic, substandard reality is essential in a play populated by characters portraying bleak, antiseptic, substandard souls. To illustrate what I mean, consider the play’s opening tableau: a very short scene in which a young mother (Karen Nicole) sits in a shabby room watching The Biggest Loser on a motel TV while her young daughter (Madeline Bertani) tries to scrub a sizable blood stain out of the carpet. Right there you have a sense of the demands inherent in this dystopia drama, demands which may require resources beyond those of most small theatres to execute effectively. In a work reminiscent of Kafka, Karen Nicole as Justine is a young mother who has gone “underground” to save her daughter from being recalled. Ms. Nicole fills her role well, functioning as the piece’s Mr. K, and capturing the anguish of a flawed human being in a flawed and inhumane society. In the character of Lucy, Justine’s daughter, playwright Clark has tried to refashion a gen-Y version of Rhoda from The Bad Seed. A challenge she hasn’t quite pulled off. Madeline Bertani plays the role well, if at times lacking that jarring edginess displayed by a sociopathic nature. Mark Souza is David, a member of the underground network that helps the young mother and her child avoid detection by the government. 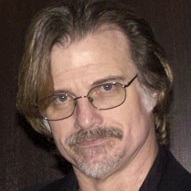 Kevin Grossman is Quinn, a Trench Coat Mafia poseur who befriends Lucy at school. Lara Fisher is Charlotte, who is the play’s embodiment of the government’s threatening presence. Of the three performances only Ms. Fisher falls short of the mark, which comes off more as a “Stepford Bureaucrat” rather than the danger presented by a sociopathic nature taken to its ultimate expression. Mr. Spurgeon’s direction is both skillful and intelligent, and the lack of either of those traits would be painfully exposed in the staging of this work in the Visceral Company’s venue. Chris Bell’s set also demonstrates those two qualities and serves the demands of the play wonderfully. Still, how often does one have the opportunity of seeing a futuristic parable on stage? The Visceral Company’s production has many merits and is nothing if not ambitious. They are to be commended for their chutzpa in choosing this work to stage, and forgiven if their reach proved somewhat beyond their grasp. That’s what heaven and LA theatre is for.